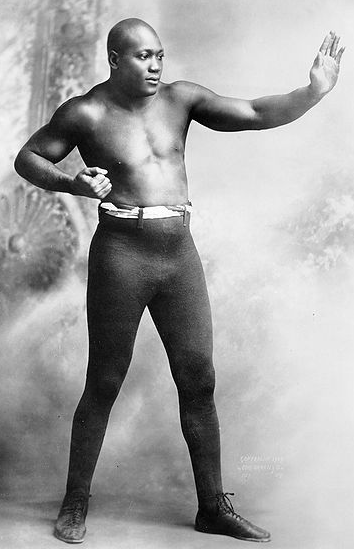 In 1914, world heavyweight boxing champion Jack Johnson was in exile. Technically his crime was violation of the Mann Act, which criminalized the transportation of women across state lines “for the purpose of prostitution or debauchery, or for any other immoral purpose.” The truth was Jack Johnson, the son of former slaves, had married Lucille Cameron, a white woman. Johnson had been convicted by a snow-white jury of the Mann Act violation even after Cameron had refused to cooperate with the case against him. Johnson decided to skip town and the couple had fled the U.S. through Canada. By 1914 they were living in Paris. Below is a video made from the film of the fight. Someone has inserted both crowd noises and voiceover/play-by-play, but it still appears to capture the key moments. In the end, the match wasn’t particularly exciting, and it was decided for Johnson. Most fight observers agreed he wasn’t in his best form and took some cheap shots when he could, but remained the superior fighter. Jack Johnson’s fascinating career trended downward from there, as he was already 37 at the time of the bout. 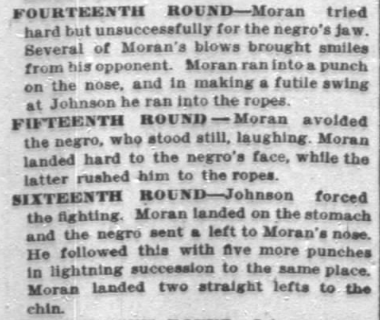 Ken Burns made a documentary about Johnson that you can read more about here: Unforgivable Blackness: The Rise and Fall of Jack Johnson. Frank Moran became a Zelig-like character, rubbing elbows with some of the 20th century’s most notable people. “The Fighting Dentist,” as he was sometimes called (huh? ), had sparred with the likes of Theodore Roosevelt early in the 1900s, and by the late 1920s he was an actor. He appeared, sometimes uncredited, in films with famous names like Bela Lugosi, Mae West, Charlie Chaplin, Bob Hope and Bing Crosby. Little noticed in Europe at large, much less other parts of the world, an Austro-Hungarian royal and his wife dined in Sarajevo, 1,111 miles from Paris. They feasted with other dignitaries on fine wine and fresh trout. The following day, June 28, Archduke Franz Ferdinand and Sophie, Duchess of Hohenberg, planned to review Austro-Hungarian troops and attend a museum dedication.